For the first 15 years of my life, I lived in a box where where my aspirations were restricted by the people around me. I never knew there was a world beyond that box—until I learned about Seeds of Peace. Camp gave me the courage to step out of that box and experience a completely different, inspiring, satisfying, inclusive, and better world. I started living and dreaming in that world. At Camp, I met so many people who influenced the direction my life has taken, like my dialogue facilitator, Lulu. From spending time with me when I wasn’t feeling well, to teaching me pickleball, to helping guide me on my work to this day, she gave me confidence and support I had never had before. Krisha, an Indian PS whom I met on the bus back to the airport on the last day of Camp, is now one of my lifelong friends and has encouraged me throughout my journey. If Camp is all about meeting the “other side,” I couldn’t think of a better way of doing so. Not long after arriving at Camp, an American Seed named Caitlin told me about an amazing project she was running to bring people from different countries together. I was in awe that she was already developing her own project at such an early age. I remember telling one of my counselors how inspiring the idea was, and how courageous Caitlin is to run the project. But I told him that if I had tried to do something like this back home, I would have been discouraged by the people around me. They would tell me that I needed to study first and be somebody before starting a project like that. Then my counselor gave me two of the most important pieces of advice I’ve ever heard. First, that I’m already somebody: I’m me. Second, that age is just a number, and if you have the passion and will, all you need is the courage to believe in yourself to start something. It was experiences like these that helped me discover my true passion: to serve my community by helping other young people follow their passion and live a meaningful life. After coming back from Camp, I started True Education, a social media campaign to help youth understand how curiosity and learning can help them find their calling. During this journey, Lulu and Seeds from across the globe helped me develop ideas that made my campaign go from a Facebook page with no following, to reaching over three thousand people through videos, to connecting to—and advising—schools and educational organizations, to teaching in underprivileged communities. When I aspired to make my ideas grow bigger, Seeds of Peace was a huge support. I was invited to attend the 2016 Paradigm Shifting and Leadership Program in Cyprus, which made me think about the practicality of my ideas with guidance and questions from my peers and staff members. In February 2017, I launched ACT Youth Force, a youth organization for empathetic and compassionate youngsters who want to bring change in their communities. In two years, Act Youth Force has impacted over 4,000 people and conducted sessions with over 1,200 students in fifteen different schools across Lahore, Karachi, and Islamabad. 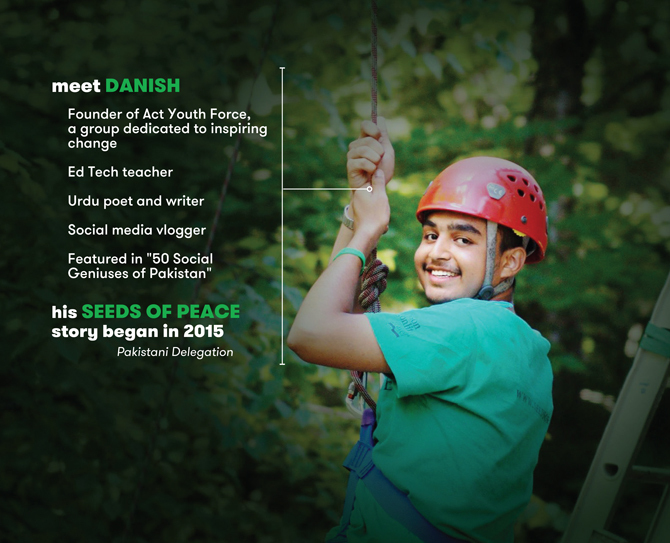 In 2017, my journey was featured in 50 Social Geniuses of Pakistan. Seeds of Peace will always be the reason for where I am today. It was the push that gave me the courage and vision to start my journey. It blessed me with an amazing community that continues to support and guide me. With the mark Seeds of Peace left on me, I am making a mark on the people around me. I now live outside the box that others had built for me. My team and I are helping students learn how to do the same; to be who they are, not what society wants them to be.